Our twentieth century education continues. One might think that a soup-to-nuts accounting of the crimes of National Socialism and Soviet Communism from 1932-1945 would be brutal and at times shocking, and one would be right. The stories of Hitler and Stalin's reigns of terror have to my knowledge never been conflated quite like this before, around a geographical cluster of lands quite rightly called "The Bloodlands" by author Timothy Snyder. 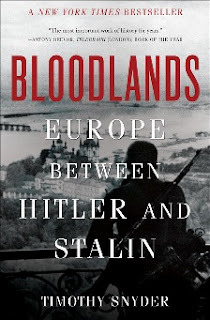 "BLOODLANDS - EUROPE BETWEEN HITLER AND STALIN" takes place solely in these countries - Poland, Belarus, the Ukraine, the Baltic states of Estonia, Latvia and Lithuania and parts of Soviet Russia - to tell a tale of unthinkable genocide that is still dumbfounding to think happened during our parents' and grandparents' lifetimes. I've read books about the Nazis and about Stalin's evil during the 1930s and 40s, but never with the sort of historical accounting provided here. From the Ukrainian famine and the collectivization disaster of 1932-33 to Stalin's Great Terror, from the Molotov/Ribbentrop pact that doomed the Polish people to the many phases of the Final Solution that killed six million Jews, this book deals solely with systematic mass murder of civilians and P.O.W.s - the defenseless. It does not tell the story of soldiers who died fighting in the war, and Snyder is very careful and very deliberate in his history. He errs whenever possible on the side of caution when using numbers, yet combines broad, thrilling description of mass historical events (the Warsaw ghetto; the Partisan warfare in the forests of Poland; the Treblinka death camp) with excellent individual quotes and citations from victims' diaries, quotes and relatives. I now can't nor won't think of the countries of The Bloodlands the same way ever again. I always knew that Poland had been doubly screwed by Germany and the Soviet Union, and robbed of virtually all of its Jews - but man, what a history of suffering for a nation that beforehand had been so strong - and actually feared by Stalin. The pact between the Nazis and the Communists that sealed Poland's fate was primarily due to Stalin's complete paranoia that the Poles were coming to get him - with the Japanese due to invade the Soviet Union from the other side. Of course, no such invasions were planned nor forthcoming, but Stalin's Great Terror rooted out anyone and everyone who could even remotely be considered a threat - and shot them dead. Man, woman and child were not immune. It's heartbreaking to see just how easy it was for so many people only 70 years ago to shoot, gas and burn massive numbers of children. Snyder makes it clear once and for all that the horrors of pre- and intra-World War II were concentrated overwhelmingly in the East. West of the Molotov/Ribbentrop line in Poland, Jews were more likely to have been sent to concentration camps to be worked (often to death) than they were to be outright gassed immediately, particularly early on. East of the line, however, Jews, P.O.W.s, Partisans, Ukrainians and more were typically shot, and thrown into pits. Bullets, not gas, ruled this side of the line, until the Nazis began to perfect the systems they put into place at camps like Treblinka - which is easily the more horrifying part of the book (which is a hard statement to make). Sometimes the killing is so mass and so ugly I have to stop and ask myself, "Wait, who killed those people again - Stalin or Hitler?". Particularly in Poland, Belarus and the Ukraine, where so many completely innocent people were killed by both. I'm a pretty well-studied guy and an ancient 44 years old to boot, and a ton of this was brand-new information to me. It helps you put the narrative of this era that we've learned in the West - Normandy, the Battle of Britain, Auschwitz - into its proper perspective vis-a-vis the more impactful story of the battles and the killing going on in the East. So while it's not an uplifting read, neither is it a gruesome parade of bodies either. It's a humane, essential work of history that will complement anyone's consciousness and knowledge of the twentieth century.